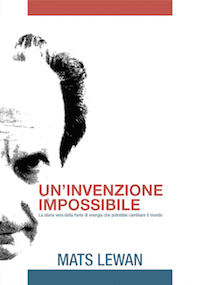 The Italian edition — Un’invenzione impossible — is finally out! | Mats Lewan: The Biggest Shift Ever. The Italian edition — Un’invenzione impossible — is finally out! (This post was originally published on Animpossibleinvention.com). I’m happy to announce that the Italian edition of my book An Impossible Invention — Un’invenzione impossible — is finally out. I’m particularly satisfied since the story is closely related to Italy to which I have personal connections, my wife being Italian. A great thanks to Alex Passi who has made the translation, and who preferred not to be compensated but instead asked me to donate part of the sales revenue to scientific research, which I will do. What research that will receive the donation is still to be defined. As is usual, the typical comment in favor of Rossi is from some lunatic. As I’ve said, with friends like that, Rossi needs no enemies. « Jobs will go away… but not work!